Canada announces a three-person literary programming committee for its guest of honor cultural program with the intent to represent its three distinctive literary traditions. Organizers of the Canada Guest of Honor appearance at the 2020 Frankfurter Buchmesse are gearing up for a major component of the project: a nearly year-long cultural program that brings literary and cultural events to Germany, Austria, and Switzerland ahead of the book fair in October. 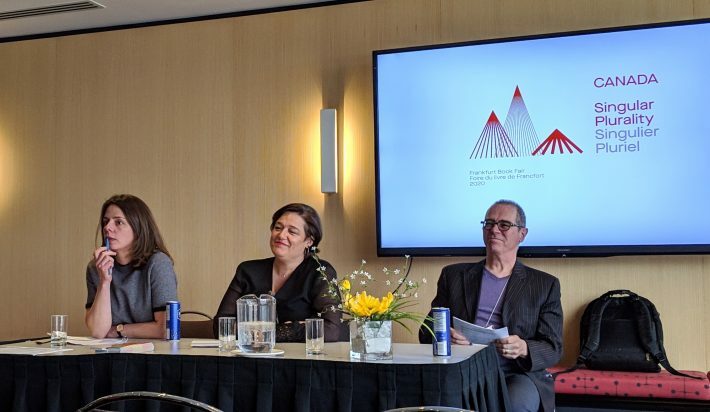 At last week’s Salon international du livre in Québec City, Canada FBM2020 and its partners in the Canadian government announced a three-person literary programming committee that will be responsible for selecting at least 80 Canadian authors and illustrators to take part in the cultural program. Each guest of honor country creates its own internal structure for organizing the project’s many events, initiatives, and exhibitions. In the case of Canada, the board of directors for Canada FBM2020 decided on a trio of literary experts to make sure that each of the country’s distinctive literary traditions—indigenous, francophone, and anglophone—are well represented in the cultural program. Heather Kanabe comes to the project with 15 years’ experience organizing cultural and corporate events. She ‘s the general manager of the Hamilton Fringe Festival. Prior to that, she worked for five years as the festival director of Word on The Street, Canada’s largest book and magazine festival based in Toronto. Claudia Larochelle is a journalist and writer from Québec. Since 2012, she has hosted the francophone book club LIRE, first on television and now in online video. She regularly appears on the ICI Radio-Canada network and writes weekly columns on culture for Avenues.ca. Hal Wake has more than 30 years’ experience in Canada’s literary scene. For 12 years, he worked as the artistic director and co-leader of the Vancouver Writers Festival. He was also book producer for CBC Radio’s Morningside show as well as the host of the Vancouver morning program, The Early Edition. The application and selection process for the literary programming committee was supervised by Bernard Gilbert, a member of Canada FBM2020’s board and CEO of Théâtre le Diamant—a new theater in Québec City that Robert Everett-Green at The Globe and Mail writes is expected to elevate the already-thriving local performing arts scene. The event speakers also presented Canada’s guest of honor branding and slogan to French-Canadian publishers. An earlier event in Toronto hosted a similar presentation for English-language publishers in Canada. The international launch of the brand will take place at the 2019 Frankfurter Buchmesse. This announcement wasn’t the only guest of honor activity taking place at the Salon international du livre in Québec City. A delegation of German children’s and YA book editors visited the fair as part of their tour of French-Canadian children’s book publishing. The trip is being organized by Québec Édition, the export arm of the French-Canadian publishers’ association, ANEL. The German editors will also visit Montreal before flying home on Wednesday (April 17). Canada’s focus on reaching out to German-language publishers ahead of 2020 extends to the country’s translation funding program, as well. The Canada Council for the Arts has created a special translation fund for German translations of Canadian books ahead of 2020. This fund is available for an expanded range of book categories and covers translation costs up to CA$20,000 (US$14,949) per title. Additional funding for promotion and production are available, depending on the type of book. More information about this funding is online here. More from Publishing Perspectives on the Canadian market is here.